Summertime is BBQ time – I guess I have mentioned this quite a lot on here lately. As much as I love to fire on the grill every other night I also love meeting with friends for a BBQ. It’s nice when everyone brings something to eat and you get to try many different things. But we never invite people to our place. It’s just not spacious enough to for many to hang out. So there’s always someone else in charge to coordinate the side dishes. So at some point you have to ask the inevitable question: What should I bring? Always followed by: Maybe NOT a salad? I have a confession to make: I hate to bring salads! This is because a) everyone brings salads and b) I don’t like salad dressing and can’t make good ones. 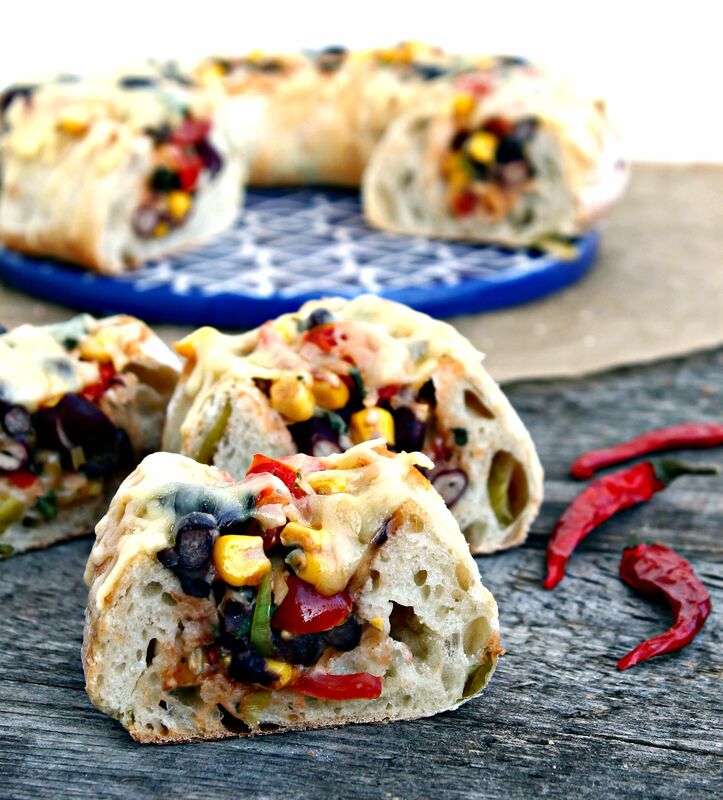 Luckily there are other options like this Cheesy Mexican Stuffed Baguette. It can be prepared easily in advance and makes a nice alternative to a salad and are also not as boring as a simple bread. The measurements of the ingredients are given for two baguette. This is because I much rather like to use up all the beans and not have three open cans at hand and also because I love leftovers! This is a perfect dinner with leftover lunch potential. You can heat it up in the microwave the next day or eat it cold. This time I used a round chiabatta like baguette which was really nice. I also tried whole wheat baguette and the classic french one. You can of course use any kind of bread but I would recommend to use one with no added spices. « 8 signs I might be a Crossfitter after all! Ugh YES! I’ve been waiting for this recipe haha. Thank you so much for sharing!!! I’m drooling over my keyboard. Totally trying this. Just pinned it to the strange but good Pinterest board. Vegas is all excited. LOL! This looks fantastic. All my favorite flavors stuffed in a loaf of beautiful, glorious bread. I love it!